Atty. Glenn Chong slammed the Sandiganbayan for their “timely” judgment on the case of Graft against Imelda Marcos. After 27 years, the Sandiganbayan convicted the former first lady for 7 counts of graft, and ordered her arrest. On a post he shared on Facebook, Atty. Glenn Chong condemned the recent “conviction” of Imelda Marcos by the Sandiganbayan. He said that after 27 years, it is quite “fishy” that they convicted the former first lady after it was known that she’ll be running for the gubernatorial seat. Chong also claimed that when the demolition job against Rep. Imee Marcos failed, it was her mother’s turn to be demolished. He said that all of these, are part of the dirty game of politics. 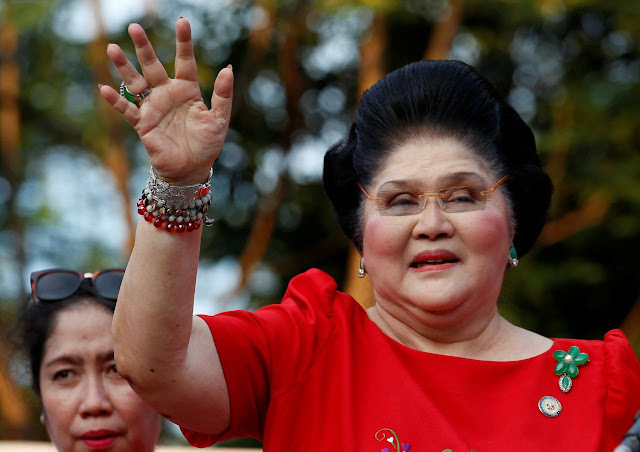 Earlier today, the anti-graft court of the Sandiganbayan found the Ilocos Norte 2nd District Representative Imelda Marcos guilty on 7 counts of Graft for creating several organizations in Switzerland from 1968 - 1986 while she was still a public official. The promulgation of decision were made without the presence of the accused Imelda Marcos or her lawyers. She was sentenced to 6 to 11 years in prison for each case and will be disqualified from seeking and holding public office. 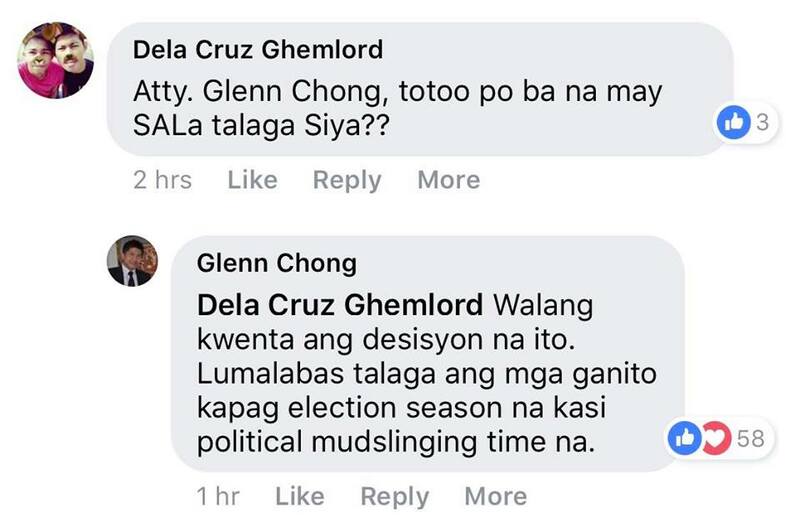 According to Chong, the timeliness of the judgment, which is a few weeks after the filing of the COCs and months before the election reeks of the foul smell of political mudslinging. He slammed the Sandiganbayan for ruining their credibility and allowing itself to become a tool for smear campaigns. The outspoken lawyer, who is an election reform advocate, advised the former first lady not to be fazed by the decision, since the legal battle is far from over. 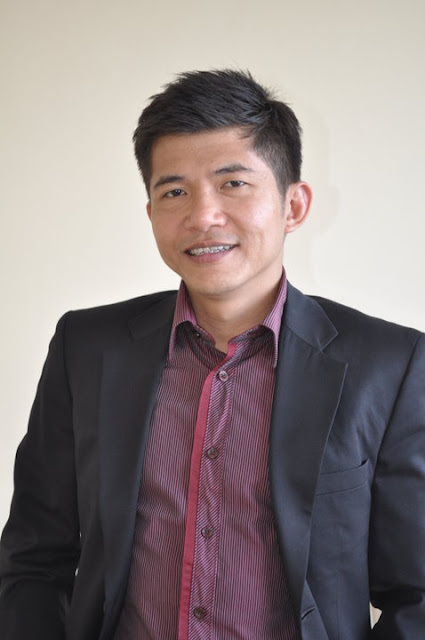 Chiong said that it is just a ploy from political enemies by the Marcoses, pointing to Rodolfo Farinas. Matapos ang 27 taon, ngayon lang nahatulan ng Sandiganbayan na "convicted" si Rep. Imelda Marcos. Dahil hindi nagtagumpay ang matinding tangka noon na sirain si Gov. Imee Marcos, ang kanyang ina na siyang tatakbong gobernador naman ang tinarget ngayon ng kalaban upang makalamang sa maruming laro ng politika. The fact na ngayon lang lumabas ang desisyong ito, ilang linggo matapos ang filing ng COC kung saan naging malinaw kung sino ang kalaban, at ilang buwan bago ang halalan, umaalingasaw ang malansang amoy ng political mudslinging. This greatly "discounted" the credibility of the judgment of conviction. It has become a tool for negative or smear campaigning. The Sandiganbayan, mindful of these circumstances, could have chosen a better time to promulgate its judgment in order to uphold its credibility, if it was not farcical one in the first place. This legal battle is far from over. Kung ako ang nasa kalagayan ni Rep. Imelda Marcos, wala akong dapat alalahanin dahil otot lang ito ni Fart-riñas!